Diane Weidinger mixes herbs in her beloved kitchen. 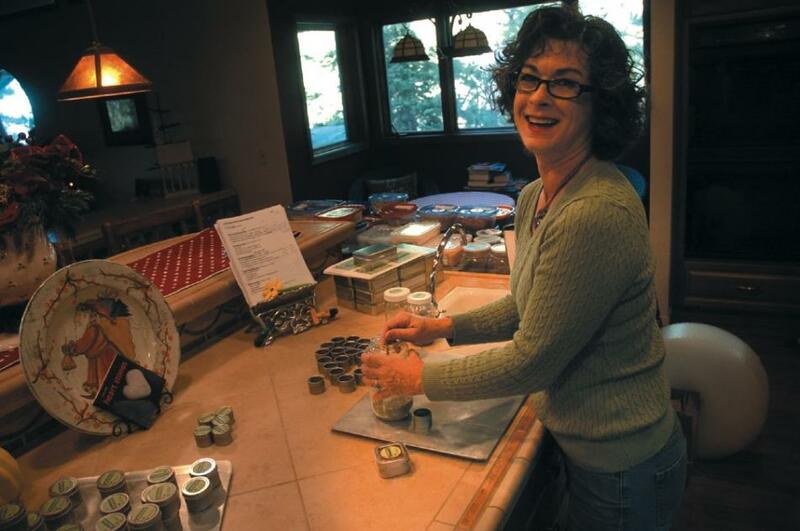 From behind the island in a large stone and brick kitchen, Diane Weidinger goes about her business, carefully filling small tins with her spice blends to be shipped to customers near and far. Along with jars, tubs are stacked on a table at the end of the island. More jars crowd one end of the countertop. Weidinger is filling an order including blends of Egyptian, Scandinavian and Moroccan spices and more for a customer who wants to highlight workplace diversity. In fact, the high energy Weidinger — who has a caffeinated spirit about her — offers 46 original ways to spice up life, or at least the table with, among many others, Spanish, Rocky Mountain and Malaysian flavorings. Her only unoriginal product is the signature blend of culinary doyenne Julia Child.
. The name comes from Weidinger's collection of heart shaped rocks, which she has amassed over 30 years. She found so many while preparing the garden at her Kingsbury house, that she and her husband named their home Heart Rock Ridge. "People are intimidated by spices. Once you start using them more often, you get comfortable," Weidinger said. One of the best ways to get started is through Weidinger's spice-of-the-month club. Subscribers receive one spice blend a month along with a recipe. Weidinger hand mixes her blends in small quantities to ensure freshness — no more jars of various spices going stale in the cupboard — hand fills each order, and avoids ingredients containing big words that end in "oxide," she says. Half of Weidinger's blends are salt-free for those watching their sodium intake. Different varieties of the blend can also be used to flavor healthy foods, such as vegetables and chicken, that can get old night after night, Weidinger said. "Every night of the week, it will taste different." In addition to her herb and spice cooking blends, Weidinger offers bath blends and sachets. The cost of individual tins of Weidinger's spice blends ranges from $2 to $6.50. Kits and gift collections range from $16.95 to $62.95. Weidinger donates ten percent of her profits to the soup kitchen Bread and Broth, where she serves as director, and to the George Whittell Thunderbird Lodge, where she is a certified master gardener. — or by phone at (775) 588-3993.